Prezident Brown plays with a full band on Friday, April 4, at 19 Broadway, 17 Broadway Blvd., Fairfax. $15-$20. 415.459.1091. 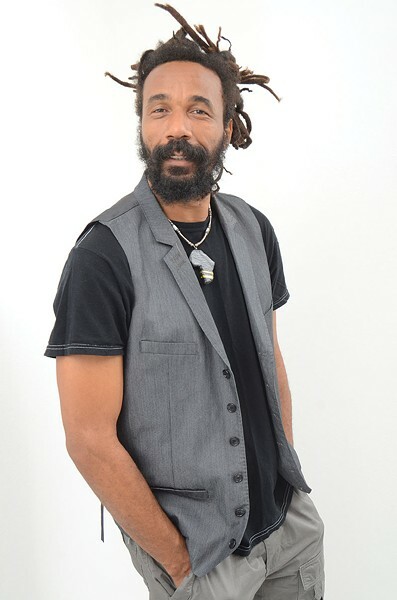 TOWERMAN Prezident Brown his thought-provoking brand of reggae to 19 Broadway in Fairfax. As the sun set on the Reggae on the River Festival last August, the towering figure of Jamaican roots artist Prezident Brown could be seen walking down a path among the Humboldt County redwoods. Reggae music filled the expanse of a river not yet parched by drought, and huge Jamaican flags waved in the breeze as Brown came into view, his gentle smile reflecting the early evening light. It was a compelling image. At 6-foot-3, the reggae singer has a striking nature that exudes mindfulness, a characteristic he is pleased to share with fans stopping him when on the road. And whenever he parts ways with his fans, Brown stands at attention with fists pressed together in front of his heart and exclaims, "Towerful!" It's a symbolic gesture from Brown that leaves fans shouting, "There goes the Towerman!" The underlying philosophy is more than just a handshake. "Tower" stands for "thinking, overstanding, working, enlightening and reasoning." Each word represents a spiritual and pragmatic tool for making one's way through the chaos and materialism of our fast-paced world. Prezident Brown's career spans three decades. Often hailed as Jamaica's best-kept secret, Brown is now working with Kingston producer Rivah Jordan and says he's been dipping into a pool of artists to collaborate with on an album due this fall. He's mum on whom he might be teaming up with. Even if he's keeping his collaborators a secret for now, Brown does wear his political message on his sleeve. His current West Coast tour is called the "No-GMO Tour." "The issue of food is very important to speak on, as an artist," he says via telephone, "for the human beings that might not know or understand what is happening. I am using my platform to raise the awareness of what is happening with food." But what if GMOs are not all bad? "There is no scientific proof," says Brown, "but what does that mean? That we should go ahead with this experiment? The population is going to be the experiment. It is big money and the control of profits—food being controlled by profit." Music fans promote food sovereignty when they align with artists like Brown. The solution to GMOs lies with the masses—so dance and be Towerful.